Guilford Medical Aesthetics provides spider vein removal to the Flowery Branch, GA area. Our professional technicians are specially trained and offer the highest level of care. Spider veins are webs of unsightly red and blue veins that most commonly appear on the legs but can show up anywhere on the body. These dilated superficial blood vessels develop when the valves inside the vein no longer close properly, allowing blood to flow backward and collect inside the vein. Spider veins also appear more commonly in women. 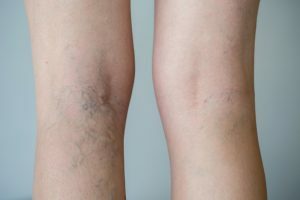 While spider veins can be an early indication of more serious venous issues, in most cases they are only a cosmetic concern. However, if you start to feel a burning or itching sensation in the area of the spider veins, you should seek medical attention. This can also make dealing with the condition more difficult, and there’s no need to do this when simple treatment options are available. Having treated patients from Flowery Branch and the surrounding area, we are North Georgia’s home for spider vein removal. Luckily, spider veins are not a permanent condition and are fairly easy to treat. At Guildford Aesthetics, we use the Cutera laser to zap away your spider veins. We simply place the laser over the area and begin applying the treatment. The laser will send small bursts of energy to the area, causing the veins to close and disappear. Doing this allows blood flow to be redirected to healthy veins. In just a short period of time, the spider veins will be completely gone and you’ll return to having healthy-looking skin. If you have spider veins that you’d like to get rid of, call Guilford Medical Aesthetics at 770-532-3306 to schedule an appointment for spider vein removal.